A black and white negative of the front of 705 Brock Street South in Whitby, Ontario. View is from the street. Reginald Erskine McArthur (1878-1938) and his wife Marie Lucie (Eariepy) Erskine lived at 705 Brock Street South in Whitby, Ontario. They had three children: Reginald Joseph, Marguerite and Jean. 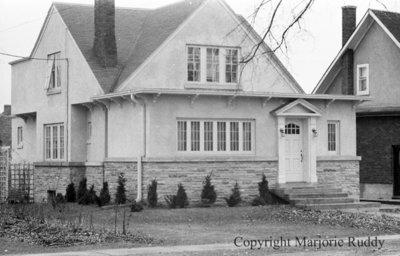 705 Brock Street South, March 23, 1938, Marjorie Ruddy. Whitby Archives A2013_040_970D.